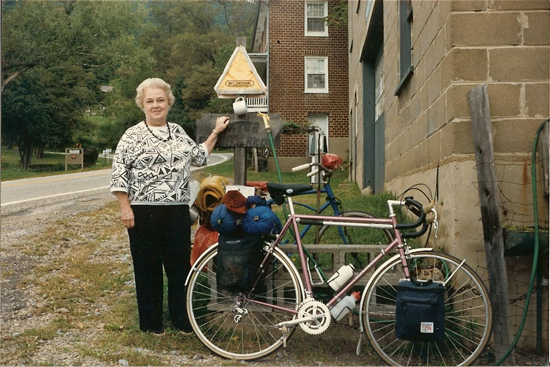 June Curry (aka The Cookie Lady) received the Adventure Cycling Association’s first ever Trail Angel Award in 2003. The award has since been named after her, in honor and recognition for her help towards over 11,000 weary traveling cyclists on the Transamerica Trail. June Curry began baking cookies for cyclists the very first year that the Transam was run, during Bikecentennial ’76. Curry lives atop a ridge just after a grueling climb in Virginia, just before the Blue Ridge Parkway. 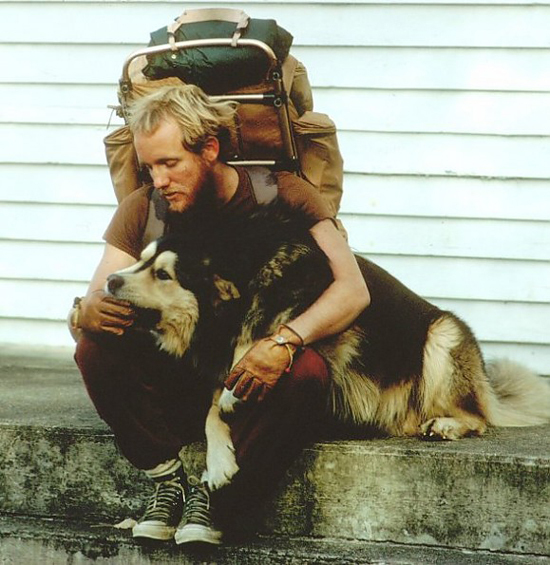 Over the years Curry offered water, lodging, a place to relax, and of course cookies in exchange for stories from people all around the world. 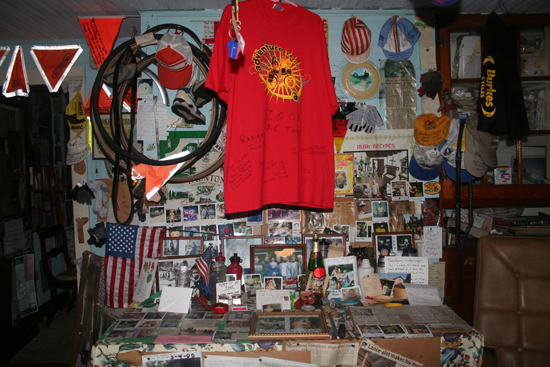 Curry’s home (and cycling “hostel”) serve as a literal museum, with yellowed polaroids, sweaty caps, and used bike tires, archiving over thirty years of the Transam. Over the years there have been hundreds of articles written about The Cookie Lady, including from the New York Times. Hats off to you miss Curry. To get all this Boy Scout memorabilia and lots, lots more (including an 8 lb Boy Scout cast iron skillet made by Lodge) head on over to the Boy Scout store here. Take it easy, all. Have a nice, warm Friday evening, Saturday afternoon and Sunday morning. Drink a lot of coffee and eat a big bowl of grits. Put on a puffy ol’ coat and lay down in the snow. We’ll see you again on the last day of this fine month. Until then…. 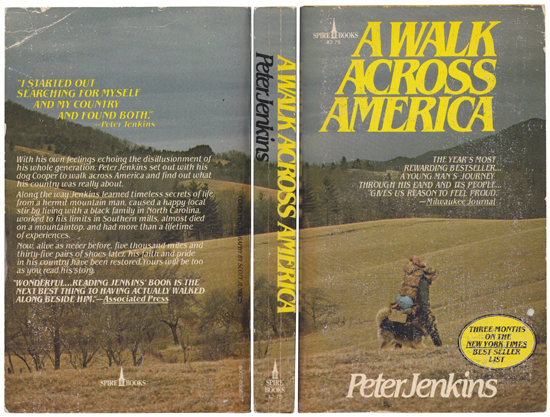 Currently re-reading this 1979 book by Peter Jenkins, A Walk Across America. Perfect winter read when you’re good and itchy-footed. This book was a serious bestseller back in ’79 and has been reprinted a ton so there’s a dusty paperback in almost every thrift store I’ve ever been in. Or grab one here. 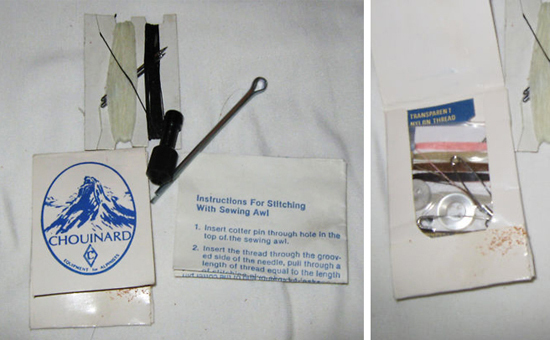 Why settle for this stitching awl (which is still great) when you can get down with Yvon’s stamp of approval, in a leather satchel to-boot? I know I’m shooting myself in the foot by doing this, but grab this guy on ebay. Don’t think my $11 bid stands a chance, but too great not to share. More to come on Winter OR, but among the bright colored jackets, Vibram soles, energy bars and ugly sunglasses, there was MountainBoy Sledworks, a company from Silverton, CO that handmakes flyer sleds, pull sleds and toboggans. Nothing that I’ve used in many years, but that is one nice looking winter ride. America ReCycled is a project by brothers Tim and Noah Hussin, drifting around the country on bicycle to document and redefine the American Dream. So far they’ve made three short films, one on their starting place, building their new bikes from scratch at an Asheville, NC bicycle co-op, while staying at an Urban Homestead named The Montana House. The third titled “Notes from the Road” documents their first few days of the journey. BEAUTIFUL. 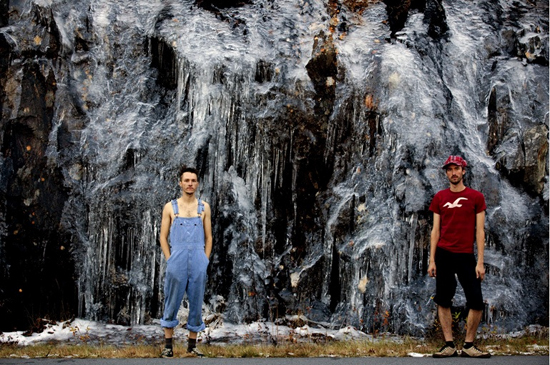 “We’re two brothers riding recycled bicycles across the United States and meeting people. Lots of them. But whether they’re devout Baptists who’ve lived in a small southern town for four generations or disaffected crust punks packing themselves into a crumbling squatted building, there is a common thread that ties them together. We sense a growing movement in this country that rises above race, region, and subculture. Americans are yearning to rebuild space, community, and local culture, each in our own way. And it’s going to take a lot of blood, sweat, and ambitious insanity. It will mean different things for different people. Some are rethinking business models to facilitate more intimate and local exchange. Others reinvent living spaces to allow for more community at home. It’s coming from all different angles and from all sorts of people. Fuel and transportation, energy use, urban/suburban planning, building construction, farming and food production, public space and civic art. And it’s already started. All across the country, people are finding innovative ways to come together and make revolutionary change on a local level, to regain control of their lives, rediscover independence, and recycle the American Dream. Help the guys out along the way with a meal, have ‘em stay a night if they’re passing through or shoot them some cash for a diner meal along the way. 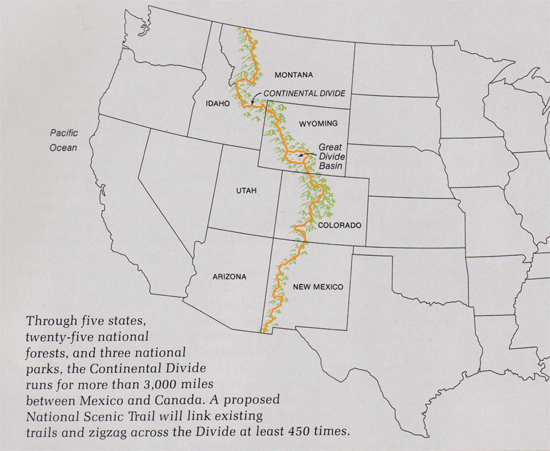 The Continental Divide Trail runs for 3,100+ miles from Mexico to Canada, along you guessed it, the Continental Divide. 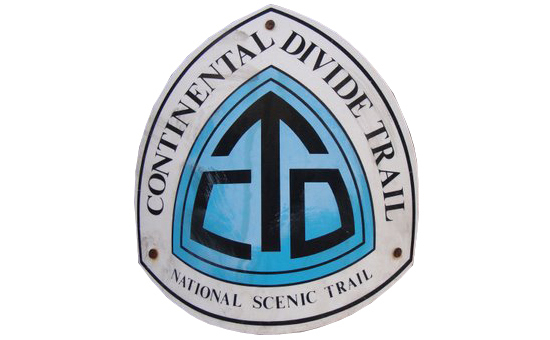 The Continental Divide Trail Alliance (CDTA) was formed in 1995 to aid in the completion of the trail, and help maintain the miles already blazed. 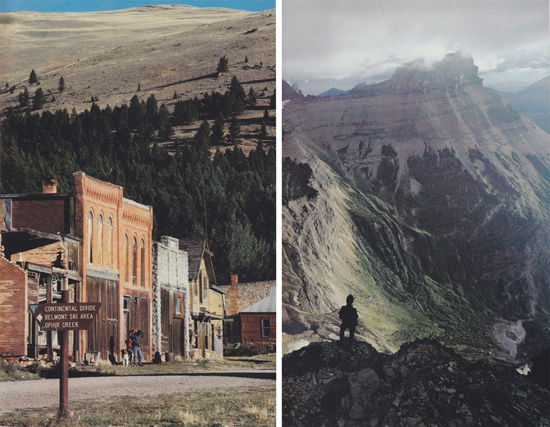 In 2007, Francis Tapon round-tripped the CDT, by first hiking from Mexico to Canada, then back. The trip took him 6 months to finish, and rounded out his Triple-Crown. There is a similar mountain bike trail through the Great Divide Basin spanning from Banff, Canada, to Mexico. Check out the trailer for Ride the Divide, a documentary about the “world’s toughest mountain bike race”. Sheesh. 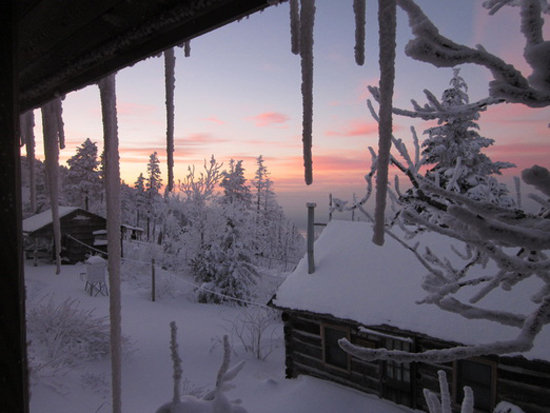 High on LeConte is a blog that acts as a daily journal/weather record for those who work at the LeConte Lodge, on Mt. LeConte (Elev. 6,593 ft.) in the Great Smoky Mountain National Park. During the winter months, only one person at a time acts as caretaker of this snowed in lodge and set of cabins, which remain closed for the most part until spring. They keep tabs on the weather, take videos/photos for the park, and have lots of time to themselves. Sign me up. 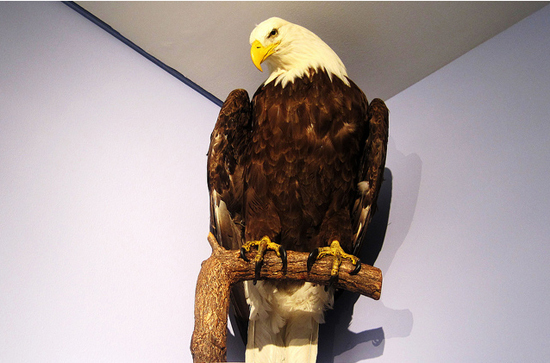 While Bald Eagles were removed from the endangered list in the U.S. in 1995, and from the threatened list in 2007, it is noted by the U.S. Fish and Wildlife Service in a recent report that an alarming number of Bald Eagles are being found dead on roadways here in Michigan. As the winter sets in and lakes and streams freeze over, fewer available fish pressure bald eagles to scavenge roadkill, be it deer, coyote, fox or raccoon. Don’t know if this increase is true the nation over, but wherever you are, be careful out there.